This card can only attack if you control exactly 3 "Noble Knight" monsters (and no other monsters). 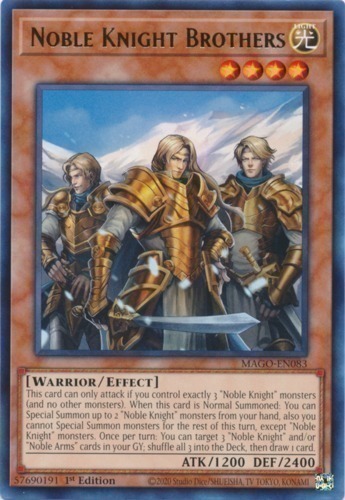 When this card is Normal Summoned: You can Special Summon up to 2 "Noble Knight" monsters from your hand, also you cannot Special Summon monsters for the rest of this turn, except "Noble Knight" monsters. Once per turn: You can target 3 "Noble Knight" and/or "Noble Arms" cards in your GY; shuffle all 3 into the Deck, then draw 1 card.